The House Science space subcommittee’s 2013 Authorization Act intends to refocus NASA’s exploration path towards prioritizing the goal of landing humans on both the Moon and Mars, according to draft document. Ahead of a hearing on Wednesday, the political direction also pours cold water on the realigned Exploration Mission -2 (EM-2) to explore a captured asteroid. 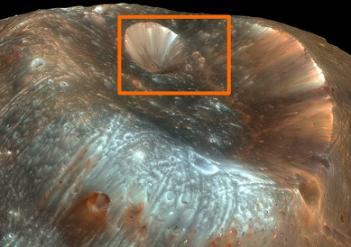 In 2004, President Bush announced the Vision For Space Exploration (VSE). The plan revolved around a “Moon, Mars and Beyond” roadmap, before it eventually fell by the wayside as the Constellation Program (CxP) failed. Rising out of the CxP’s ashes, the current plan continues to have an end goal of reaching Mars, albeit much later than the VSE’s proposed schedule. In fact, very little by way of specifics have been revealed into the schedule, other than the aim is to land humans on the Red Planet by the “mid 2030s”. 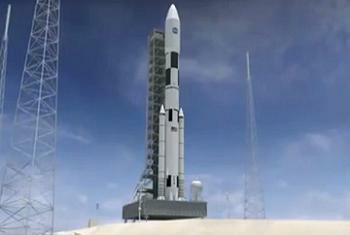 With the Space Launch System (SLS) and Orion as the centerpiece of NASA’s Beyond Earth Orbit (BEO) ambitions, a 2017 test flight will validate the launch vehicle and spacecraft during Exploration Mission -1 (EM-1) – an uncrewed mission to send Orion on a test flight around the Moon, ahead of Exploration Mission -2 (EM-2). which involves sending a crewed Orion on a mission to meet up with a captured asteroid in the vicinity of the Moon. An undefined manifest follows, although the aim would be to venture further out into deep space for a “full up” Near Earth Asteroid (NEA) mission(s), before taking the big step towards Mars itself. From NASA’s standpoint, a return to the surface of the Moon was cancelled when the Constellation Program (CxP) ended. However, notional plans continued to be evaluated over recent years, with Lunar Surface Sortie missions cited in the Exploration Roadmap via Design Reference Mission (DRM) documentation. 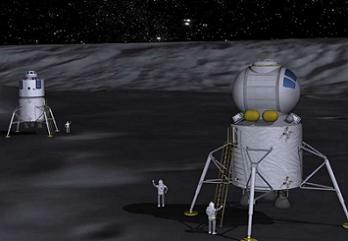 As with any Moon return plan, the Lunar Lander – either a resurrection of the Altair lander or another option – would be a key element of the viability for returning to the Moon – although NASA’s lander would be far larger and would require the Space Launch System (SLS) to launch it into space. It would also be massively expensive. 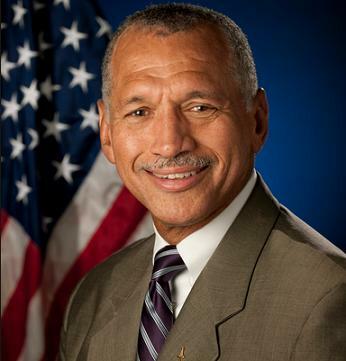 However, any hope of the Lunar Surface option making a confirmed return to the exploration roadmap’s baseline was dismissed by NASA Administrator Charlie Bolden, who strongly ruled out missions to land on the Moon, claiming any future political re-direction to return humans to the lunar surface would send the Agency “back to square one”. That re-direction now appears to be on the cards, per the House Science space subcommittee’s 2013 Authorization Act, with a proposed draft for discussion outlining direction to focus on landing on the Moon as a precursor for landing on Mars. It also appears to remove – or at least show no funding for – the EM-2 Asteroid Retrieval Mission elements from the roadmap. This is unlikely to be well received by General Bolden, who added to his concerns relating to a political re-direction to return to the Moon, claiming such a move would all-but end any chance of being able to go to Mars by the 2030s. “We need to try and get all of us on to the same sheet of music in terms of the roadmap,” noted the NASA head in May of this year. “(If we) have someone in the next administration who could take us back to a human lunar mission, it’s all over, we will go back to square one. According to the House version of the 2013 Authorization Act draft, a request would be made for the creation of a Mars Human Exploration Roadmap. The draft language also states the Administrator should present the Roadmap within one year of the Act’s enactment. The roadmap should “include the specific set of capabilities and technologies required to extend human presence to the surface of Mars and the mission sets necessary to demonstrate the proficiency of these capabilities and technologies. The draft also requests details on international cooperation and the potential for utilizing non-governmental entities. It also requests the Administrator should update the Roadmap at least every four years and include it in the budget for that fiscal year transmitted to Congress. Per the DRM process at NASA, Mars missions are only listed under “Forward Work” – with the DRM tags of MAR_PHD_1A and MAR_SFC_1A. Notably, the Flexible Path approach remains the most recent and comprehensive outline into achieving a crewed mission to Mars, built out of the recommendations from the Augustine Committee into Human Space Flight. 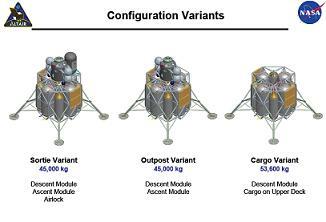 Per documentation, a fleet of SLS’ would be required for a single crewed mission to Mars mission, including other numerous vehicles, most of which are very much at the conceptual stage of design. 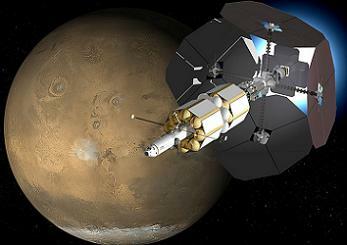 Currently, there isn’t an agreed baseline approach for setting up a mission to Mars, with the Flexible Path noting the requirement of 10-15 HLV launches – via the use of chemical (LH2/LOX) rockets, while the video shows a launch campaign using seven HLVs, sporting nuclear propulsion stages. The Mars campaign video shows seven HLVs launching the major elements of three vehicles using NTR (Nuclear Thermal Rocket) propulsion, namely the MLV Cargo Vehicle – created from two HLV launches, the MLV Habitat Vehicle – created from two HLV launches, and the MTV Crew Transfer Vehicle – created from three HLV launches. 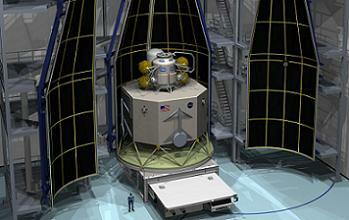 All three vehicles are assembled in Low Earth Orbit ahead of setting sail for Mars. Another Mars exploration plan was created by Boeing, citing a combination of the SLS rocket’s lift capability, the bourgeoning Solar Electric Propulsion (SEP) technology field, and Bigelow’s soon-to-be-tested inflatable habitat modules. Additional details in the proposed political direction from the House are expected at Wednesday’s Hearing. You can follow updates on the hearing, by clicking this link.